At a special press event held at the Ministry of Sound in London this morning, Nokia introduced “Ovi” the company’s new consumer facing Internet services brand, and in doing so, took aim at Apple, its mobile carrier “partners”, and — to a lesser extent — dot com giants Google and Yahoo. At launch, “Ovi”, which means ‘door’ in Finnish, will encompass the highly anticipated Nokia Music Store, a revamped N-Gage (Nokia’s mobile gaming platform — see our earlier report), as well as Nokia Maps, a navigation service that offers maps and city guides. The first version of Ovi.com, which can be accessed either directly from a compatible Nokia device or from a PC, is scheduled to go live in English during the fourth quarter of 2007, with additional features and languages added during the first half of 2008. 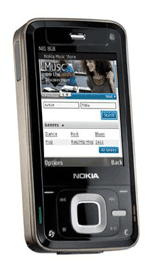 Nokia also announced two new N-Series phones, the N81 (music phone) and the Nokia N95 (8 GB). “The later with its large screen and higher storage capacity clearly is being launched as a way to ward off the Apple iPhone challenge”, writes Om Malik, over at GigaOm. 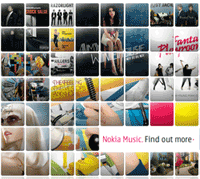 Nokia’s new music download service will offer “millions” of tracks from major record companies, as well as independent labels and a “broad range of local artists from around the world” (press release). Music will be sold “over-the-air” through compatible Nokia devices, as well as being able to be purchased and “side-loaded” via a PC, with syncronization offered both ways. Additional functionality includes a “dynamic recommendation engine” and music wish-lists. The service will employ Windows DRM (so no Mac or Linux support), bucking the recent industry trend towards DRM-free downloads, with individual tracks costing €1 and albums from €10. A PC-based ubscription service will also be offered, costing €10.00 per-month. The Nokia Music Store will open across “key European markets with additional stores in Europe and Asia opening over the coming months” — so, for the the time being at least, North America is set to miss out. By launching its own music download store, Nokia will not only have to compete with Apple’s iTunes, but the company has also put itself on a collision course with the very same mobile carriers with which it’s forced to partner. Earlier in the week The Independent newspaper reported that European carrier, Orange, was unhappy at the prospect of Nokia competing against its own over-the-air music service, and was threatening to boycott future Nokia handsets. Other carriers are likely to have a similar reaction, which may well force Nokia to share revenue generated from its store. Like with Apple’s iTunes/iPod ecosystem, Nokia is now in a position to control the whole user experience, by designing both the software and hardware required to use its music download service, and this is obviously one motivation behind the company’s attempt to bypass the networks. As the Financial Times notes, mobile carriers have a pretty poor track record when it comes to creating good user experiences. However, a second, and perhaps, bigger reason behind Nokia’s “Ovi” launch is that profits from hardware sales are falling, requiring the company to reinvent itself as one that provides a broad range of mobile services — and in doing so, will inevitably have to wrestle some power away from the carriers. I have a new Nokia E61 and I am very disappointed. Really, I can not imagine people using that user unfriendly system to install applications, listen to music and surf the web. The whole phone is far from being a nice user experience. I am very happy that Apple is in the mobile market now.